The Roof, 26th floor, Four Seasons, 1418 Professor Wafic Sinno Avenue, Minet El Hosn, Beirut, Lebanon 2020 4107. +961 176 1000. Glass-enclosed rooftop swimming pool with 360 degree views. A light menu of fresh sandwiches, salads, tempura and barbecue items is available. Daily 6am–8pm. Food Service 12 noon-5pm. Club 26 offers a club style vibe with Asian-inspired tapas menu and signature cocktails atop Beirut's highest bar. White, 8th Floor, An Nahar Building, Martyrs' Square, Beirut, Lebanon. +961 306 0090. Playful rooftop eatery that is more than just a view. Hybrid supper club and lounge. Moon on the Rocks, The Mayfower, Rue Neame Yafet Street Hamra, Beirut 113 5304. Lebanon Overlooking the downtown skyline, Moon on the Rocks is an ideal place for watching stunning sunsets over the city. This terrace lounge creates a feeling of well-being and is a place to unwind or partake in morning, enjoy light lunch or traditional afternoon tea. On the adjacent roof top sun deck there is also a mini pool available for all the hotel's guests (open in summer only). 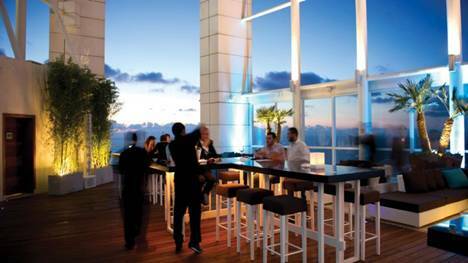 Top 21 Rooftop Restaurant, 21st floor, Crowne Plaza Hotel, Hamra St, Beirut, Lebanon 113-7512. 961-1-754755 Superb views over the Mediterranean and the Lebanese mountains, as well as a remarkable perspective of the capital itself. Lunch 12 noon–3.30pm. Dinner 7pm–11.30pm. Indigo on the Roof, Le Gray Hotel, Martyrs' Square, Beirut, Lebanon. +961 196 2828. Spectacular views of the city. Indoor and outdoor terrace seating with panoramic views. Cherry on the Roof Lounge, Le Gray Hotel, Martyrs' Square, Beirut, Lebanon. +961 196 2828. 8.30pm-2am. Open rooftop closed in Winter. Bar Three Sixty, Le Gray Hotel, Martyrs' Square, Beirut. + 961 471 3467. A circular cocktail bar with 360 degree views. 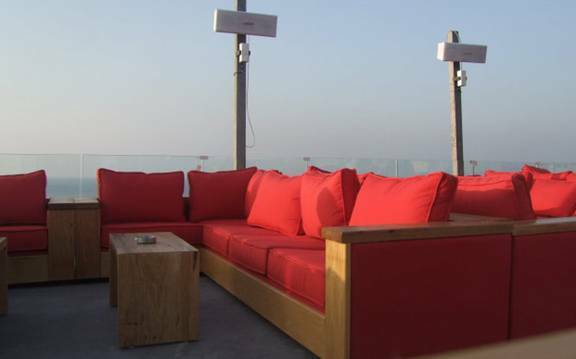 Exciting panoramic views to the Mediterranean and Mount Lebanon from this rooftop restaurant and bar. Fly above Virgin Cafe, Virgin Megastore, Al Shouhada Street, Beirut, Lebanon. Located on the rooftop of the Virgin Megastore, in Downtown Beirut If you reserve a good table, you'll enjoy a breathtaking view on the martyrs' square and the port. 03 030 340 Sun to Thurs 7pm-12 midnight. Fri & Sat 7pm-2am. Eau de Vie, 11th floor, InterContinental Phoenicia Beirut, Phoenician Tower, Minet El Hosn, Beirut 846. +961 136 9100. Lunch. Dinner. A fantastic view of the Mediterranean. Le Ciel, 31st floor, Habtour Hilton Grand Hotel, Charles De Gaulle Street Horsh Tabe, Sin El Fil, Beirut 55555. +961 150 0666. The Aquarius Pool Bar, 18th floor, Gefinor Rotana Hotel, Clemenceau Street, Hamra, Beirut. +961 137 1888. Unsurpassed views of the Mediterranean Sea and the snow-capped mountains of Lebanon. Rooftop swimming pool. Daily 9am-10pm. The Terrace, Albergo Hotel, Relais et Chateaux, 137 Abdel Wahab el Inglizi Street, Achrafieh, Beirut. +961 133 9797. 8am-12 midnight. Seasonally closed November 15th to April 30th. Coop D' Etat rooftop. Gemayzeh (Pasteur-down alley between Loge and Kobe), Beirut. +961 71 134 173 The rooftop at Saifi Urban Gardens. Overlooking the Beirut port. Abdel Wahab, 51 Abdel Wahab el Inglizi St, Monot, Ashrafieh, Beirut. +961 1 200550 Gourmet Lebanese experience year-round next to the bubbling fountain on the roof terrace. Daily 12 noon-12 midnight. Bice, 3rd Floor, Pavillion Royal Bldg, BIEL, Port of Beirut. 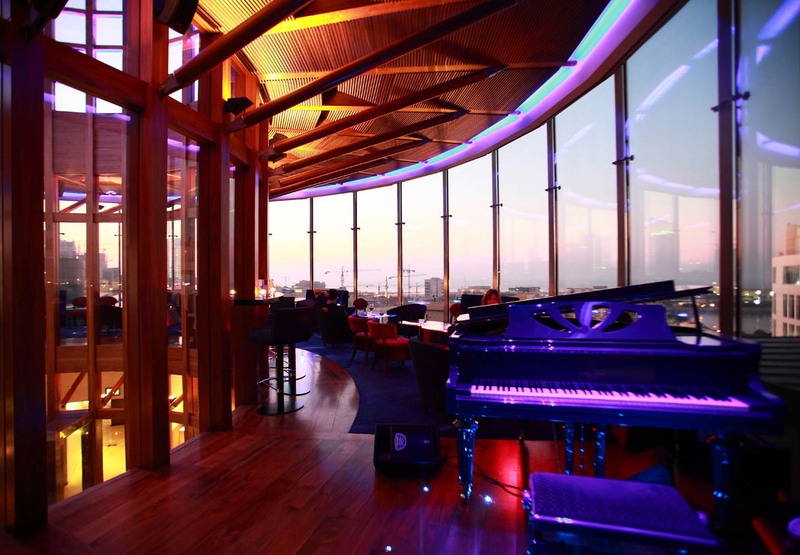 +961 199 9662 Hugely popular and distinguished Italian restaurant and lounge bar, with an all-year-round terrace. A live pianist plays every night, with a singer Thurs to Sat. 11am-2am. 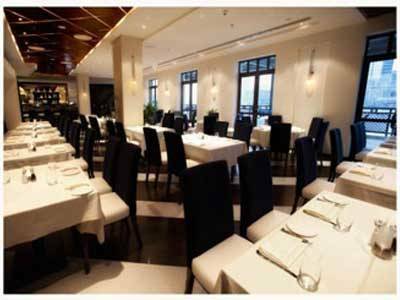 Waves Terrace, Golden Tulip Galleria, Beirut (ex. MARRIOTT), St. Elie Khalde Blvd, Jnah District, Beirut, Lebanon. Located on the rooftop of the hotel, Waves Terrace overlooks the Mediterranean Sea and the majestic mountain chains. It opens in summer only and hosts barbecues & live entertainment. Republic Rooftop, On Amaret Chalhoub, near Nahr el Mot, Zalka. +961 1 882 660. If you're coming from Beirut by the highway, take the first exit after Nahr el Mout's pedestrian bridge. Once arrived to the main Zalka street, you will find the restaurant in front of you. L'Escroc, Riachi Building, Facing Bank Audi, Al Sayde St, Achrafieh, Beirut. +961 4405 005. Rooftop and terrace that are nice in the evening. facebook. Centrale, Mar Maroun Street, Saifi, Beirut. You can enjoy a great view of Beirut from the bar. Rooftop. Sit in the modernist main area, top-floor bar or on the patio planted with jasmine trees. La Estancia, Gemmayzeh St, Beirut. Argentinean Steakhouse with a Rooftop. On the second floor and the rooftop of the building that houses the El Gardel pub. SkyCaffe, Lazarieh Bldg, Block A, Amir Bachir Street, Beirut. 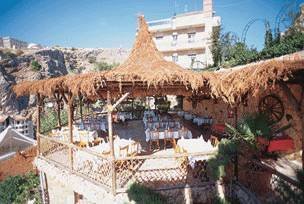 A splendid rooftop restaurant and terrace open for lunch and dinner, serving both Lebanese and international cuisine. Very elegant, with great views of the city and the sea. Daily 11am-3.30am. Aishti Seaside, 4th Floor, Aïshti Bldg, 71 Al Moutran St, Jal el Dib Highway, Beirut. +961 4 717 716 After eight years Aïshti's rooftop has not dimmed the restaurant's quest for perfection. Featuring both indoor and outdoor dining areas, the place offers an entirely unobstructed panorama of Beirut and the Mediterranean in all its shades of turquoise glory. Revolving Restaurant, Monte Alberto Hotel, Zahlé, Lebanon. A cottage like platform with tree logs as beams, sandy rocks as murals and palm branches as ceiling, combined with an unparalleled view of the town. 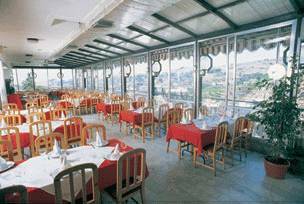 Winter Terrace, Al Ourzal and the only revolving restaurant in the region. Combine in one setting the sweetness of the river, the beauty of the plain and the splendor of the mountain. 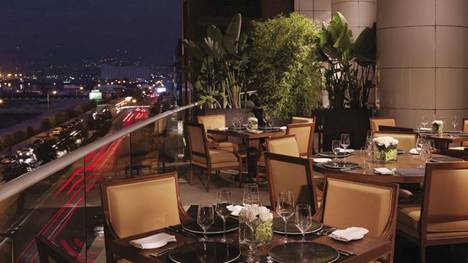 Dine while enjoying a breathtaking view of the city. Spectacular setting overlooking beautiful Wadi Zahlé and the Berdawni River, offers an awesome and panoramic view of this unique city, its famous river and the Bekaa valley.